AOG DESIGN's 1st edition customizable belt comes in two pieces: 100% genuine leather belt strap and an automatic belt buckle. Lining of each strap is pressed with original AOG logos on a bold color giving it a unique yet subtle contrast. 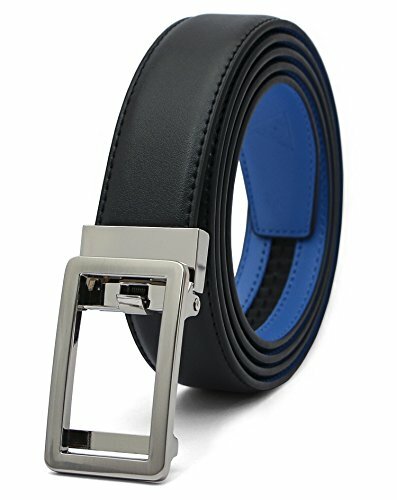 This leather strap has no holes and is long enough to customize its length to your size. We recommend heavy duty scissors for trimming. The belt buckle easily snaps on the end of the leather strap for immediate use. It's simple, flexible, easy, and comfortable. Good for both formal and casual occasions.
? SIMPLE ELEGANT DESIGN : AOG DESIGN's belt straps are 100% Genuine Leather with no holes to crack or wear out. Our unique two-tone design adds a layer of subtle yet bold statement (note: belt straps are not reversible). The look is simple yet elegant and perfect for formal dress occasions. All AOG belt straps are 1.25-inches thick. ? INTERCHANGABLE AUTOMATIC BUCKLE: Our belts slide in and automatically lock on the ratchet with that satisfying "click." You can adjust 0.25-inches at a time for that perfect fit. In order to remove the belt, fold the base of the buckle and slide the belt out. All our belts are interchangeable so mix and match your very own AOG buckle and strap colors! ? TRIM TO FIT : The leather strap is long enough to fit up to a 50" waist. Length is adjustable by trimming to your waist size (note: cut the end where the buckle will be connected). Size the belt at the comfort of your own home and have full control over your fit. ? ORIGINAL AOG DESIGN GIFT BOX : Whether it's a gift for a loved one or for yourself, all AOG DESIGN belts come with an elegant belt box. ? WE CARE ABOUT YOU : We care about your experience with us. If you are not happy with our belt in any way we will give your money back, no questions asked. We are happy when you are happy.